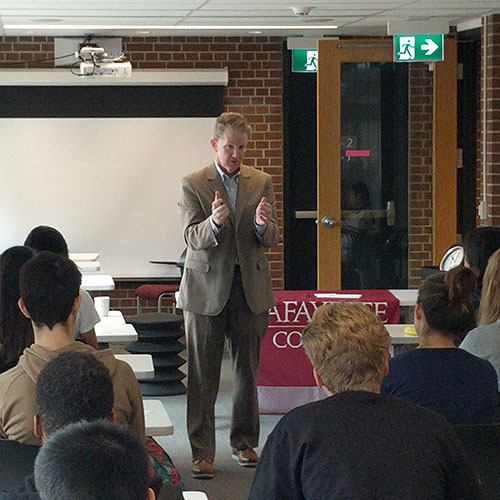 On Tuesday, April 9th, over 30 Trinity College School students who have expressed interest in applying to U.S. colleges and universities attended an information session in the library given by Mr. Greg MacDonald, director of international admissions at Lafayette College in Easton, Pennsylvania. During the session, Mr. MacDonald emphasized the importance of demonstrating interest in a school by arranging a personal interview and how targeting an application to a school of choice can be very influential in the admissions decision-making process. Other topics, such as the relevance of a campus visit, the importance of attending a school that values quality teaching and an overview of financial aid were covered. The timing of this presentation was ideal as the Grade 11 students are currently researching post-secondary options in their guidance classes (these happen once per cycle). Having the opportunity to speak with an admissions director from a very selective U.S. liberal arts college will serve as an excellent springboard for students’ future discussions with their guidance counsellors.